The Centre for Public Interest Litigation (CPIL) has moved a contempt petition before the Supreme Court alleging that the Governments of Delhi and Tamil Nadu have willfully disobeyed its judgment passed in a writ petition filed by the NGO’s - CPIL and Common Cause in which the Apex Court had issued certain guidelines to prevent misuse of public funds by government advertisements. In the writ petition filed by CPIL and Common Cause, seeking to restrain the Union of India and all State Governments from using public funds on Government advertisements primarily intended to project individual functionaries of the Government or a political party, the Supreme Court had approved and accepted, with a slight modification (in respect of publication of photographs of the Government functionaries and political leaders along with the advertisement), the guidelines recommended by the committee to look into misuse of public fund by government advertisements. The petitioners have alleged that despite there being a clear direction issued by the Supreme Court, the respondents (Chief Secretaries of Government of Delhi and Tamil Nadu respectively) have acted in willful disobedience and derogation of the law laid down by the Court. Pointing out specifically the instances of contempt of court committed by the respondents, CPIL has averred in its petition- a copy of which has been accessed by “Live Law”, that the Delhi Government has allocated Rupees 526 crores of fund for advertisement as compared to 23.7 cr in 2014-2015, 25 cr in 2013-2014, 24.9 cr in 2012-2013 and 27.6 cr in 2011-2012 ‘and is wasting the same for espousing their own political interest by glorifying the party in power’. CPIL alleges that the Delhi Government has willfully and deliberately issued government advertisement, without complying with the directions issued by the Court. 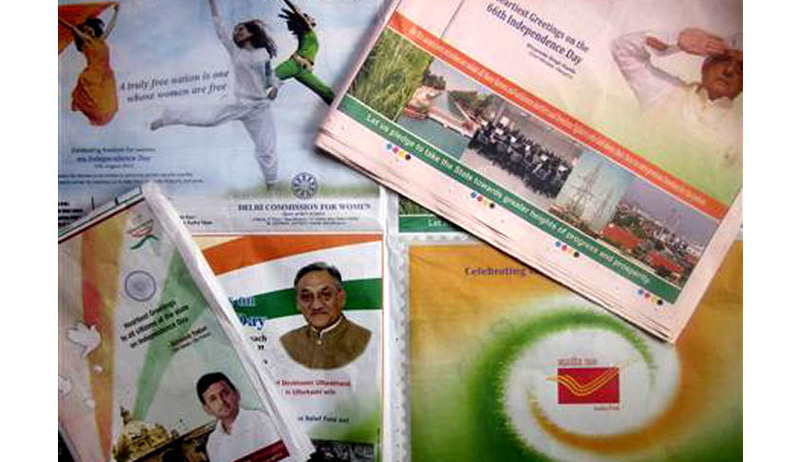 “The advertisements would show they have been issued wasting huge public money to get political mileage for the party in power, its political leaders at the cost of state exchequer”, alleges the petitioner, CPIL. CPIL has alleged that the Delhi Government is wasting public money just to espouse its own cause and to glorify its leaders. “The advertisement issued by the GNCTD would show how the party in power could waste public money by allocating 22 times more funds for advertisement just to espouse its own cause and to create glorification of the government and its leaders. It portrays a case for clear derogation and wilful violation of this Hon’ble Court’s order not only in letters but also in spirit,” avers the petitioner in its contempt petition. CPIL has accordingly sought initiation of contempt proceeding against the alleged contemnor/respondents for willfully and deliberately disobeying the direction of the Supreme Court in its judgment dated 13.05.2015.